Canby may be her home, but it's clear that Sailer Galusha-McRobbie's heart resides with the people of East Africa. Well, really, Sailer's heart has enough room in it for people from all over the world. It is that big, loving heart for people that led to her nomination and eventual selection as this year's Canby Herald Amazing Kid. Connecting with people is really what the 17-year-old Canby High School senior is all about and she enjoys walking that particular walk. "I would describe myself as unique and a little different," Sailer says. "Something that's really important to me is connecting with other people. I think each person in this world has a unique perspective and an inspirational story to share. "My heart is to connect and find out what that story is and how I, and everyone else, can learn from it," she added. Sailer, who admits she was pretty timid when she entered Canby High School, now seeks opportunities to come alongside people and talk with them – locally and across the world. "I think traveling is a huge way to help get people to connect and learn about each other," Sailer says. And she's done a fair amount of traveling, having been to several states in the U.S., as well as Canada, Mexico, and of course, East Africa. 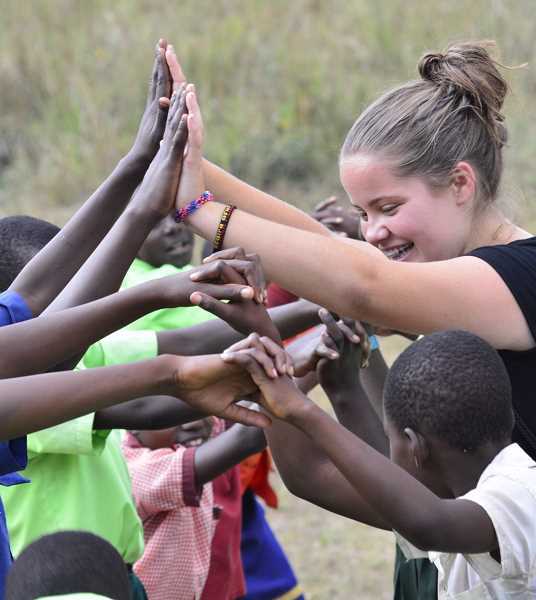 It's there, working in an orphanage in Kampala the last two summers, she's found a calling that simply won't fade. This year's Amazing Kids event will be Monday, April 30, at OMSI. Guest speaker will be former Portland Trailblazer Brian Grant. Look for the full story in a special Amazing Kids section in the May 2 edition, then online at www.canbyherald.com.